What’s the Difference Between a Credenza, Sideboard, and Buffet? “What’s in a name?” Shakespeare may have asked it first long ago, but it’s just as important a question in the world of furniture today. Terminology can vary among people and geographic locations, and even can depend upon where an item is placed in a home. For example, place a small table beside a couch and it’s an end table. Place it beside a bed and it’s a nightstand. Place it in the foyer and it’s an entryway table. In interior design, the beauty is in the details, even the semantic ones. 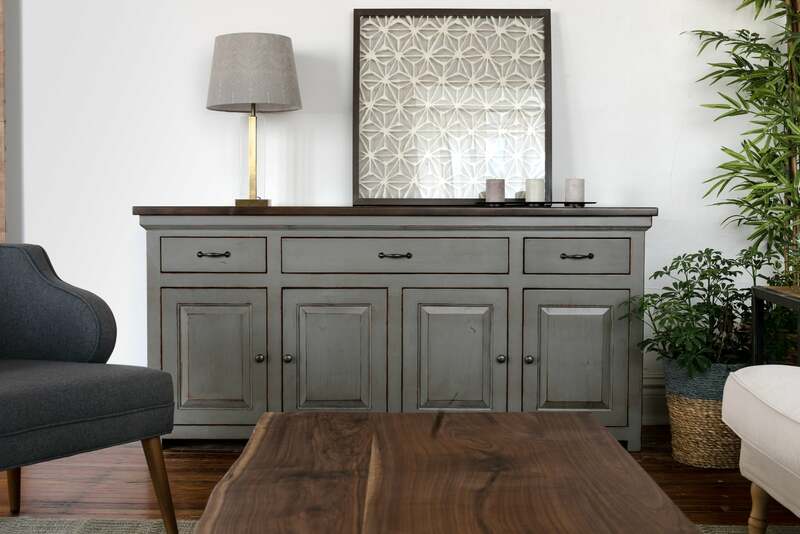 When it comes time to buy your own custom dining room or office furniture, you may find yourself asking what the differences are between credenzas, sideboards, and buffets. The terms are occasionally used interchangeably, though there are some distinct aspects to each. Let’s take a look at the difference between these names for what might seem on the surface to be the same piece of furniture. A credenza is an American term for a dining room cupboard used to serve buffet meals. It may also be used to store or display decorative serving dishes. Credenzas are sometimes smaller and more formal-looking than a sideboard or buffet. They often have no legs or else very short ones. They may have shelving in their centers surrounded by glass display cabinets on either side. They are often made of decorative wood with a heat-resistant top for setting down hot plates. In Renaissance Italy, credenzas were holding areas where taste-testers could examine a royal person’s food for poison. Back in those days, they were often decorated with columns and other ornate woodwork. These days, people use credenzas as handy tables for serving meals within their homes. Long and low, they offer plenty of surface area for laying out a buffet of food. Attractive and useful, a credenza can be a great way to display and serve food at your next party that allows guests to help themselves with ease. Sideboards emerged in England in the 18th and 19th centuries as a dining room accessory popular in affluent homes. They were often decorative pieces that had expensive wood veneer and were often used to store more general items than serving ware alone. Sideboards are still popular today and their styles can range from traditional to sleek and modern. They’re a wonderful option if you’re looking for a piece that can be used in buffet-style meal service, but which also has the versatility to fit within areas of the home other than the dining room. 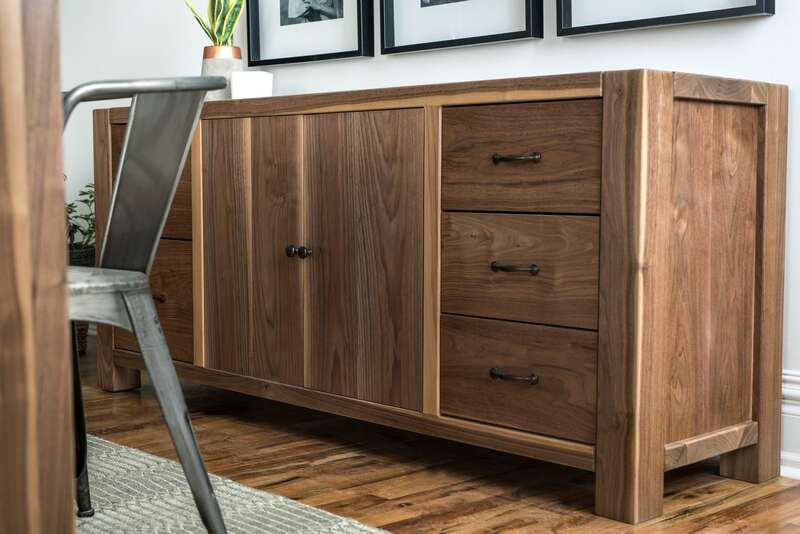 One of the best places for a sideboard is your home office. Sideboards are ideal for storing important files or references that you may need regularly but wish to keep out of sight, and they can also be an excellent home for a printer or other essential office equipment that you don’t want cluttering up your desk while you work. Some people use the words buffet and sideboard interchangeably. However, unlike sideboards or credenzas, buffet tables often sit on longer legs and are always placed in dining rooms. Buffets originated in Sweden where they were used to serve large smorgasbords. They became popular in France and soon were being used all over Europe. A buffet is another good choice for laying out self-serve food in a manner that’s easily accessible for guests and family. Whether classic, modern or country-style, a buffet can store table linens and serving wear year-round and help make your next party a success. These three pieces of furniture are very similar in appearance and function, so it’s no wonder they’re hard to differentiate. So when you’re looking for dining room storage, allow your storage needs and decorative tastes be the criteria that help you pick the best piece. Think about details such as whether you need closed or open storage (i.e., cabinets or shelves). Cabinets can hide clutter while shelves both keep items handy and put decorative pieces on display. Open shelving has a lighter, more approachable feel, but items kept on open shelves will need to be dusted regularly. If you just can’t choose, you can always go with glass cabinet doors. Finally, keep size in mind. Buy a credenza, sideboard, or buffet that’s slightly higher than the dining room table. No matter what you’ve decided on, buy your new credenza, sideboard, or buffet from a local craftsman who has built it to last. Only buy from a company that stands by their work and offers a lifetime guarantee, just in case you need help sanding out knicks, scratches or dings as the years go by. Because no matter what you call it, your new storage piece is going to house some of your family treasures for years and generations to come. And like so many other family traditions that start around furniture, you want it to last as long as your memories. At Unruh Furniture, we want to help you make your home comfortable, beautiful and functional. Our custom credenzas, sideboards, and buffets can help you feel like you’re entertaining in the dining room of your dreams, and they come with a lifetime warranty if anything ever happens. Schedule a visit to our Dallas showroom to see our full line of furniture.